A Review of Patricia Goldstone’s "Interlock: Art, Conspiracy and the Shadow Worlds of Mark Lombardi"
The current furor over the monumental corruption revealed (and concealed?) in the Panama Papers and the recent denunciations of the 9-11 “official story” by the very politicians who foisted it on us (replacing old deceptions with new ones?) sent new vibrations through the spider webs artfully crafted by New York artist Mark Lombardi in the last years of the 20th Century. On March 22, 2000, at the height of his fame and acclaim – drawing the attention of museums, art collectors, government agents, federal prosecutors, and mob connected individuals, among others – Lombardi was found hanging in his studio. Was he a victim of the spiders whose nests he had so clearly delineated? Was suicide the only way he could top his previous performances? In her 400+ page book Interlock: Art, Conspiracy and the Shadow Worlds of Mark Lombardi, author Patricia Goldstone presents the results of two years of research and makes a worthy contribution not only on the artist and his art but on the machinations of global power he struggled to make visible. Patricia Goldstone painstakingly relates a mystery in a fashion that inevitably offends all parties. This writer is unqualified to judge her take on the “art scene” of NYC and Texas, but I suspect much of the portrait is accurate enough. If Lombardi did kill himself, an unsparing examination of possible contributing factors is in order. Drugs and alcohol, business pressures, competition, paranoia and real or imagined physical threat, “fear of success” [as the police report declaimed! ], sexual competition and jealousy all get a mention. But so does the other possibility – of murder. The subjects of Lombardi’s work include many of the deadliest and most ruthless persons and organizations in modern history. The main purpose of his work is to show how these acknowledged monsters – Nazi fugitives, mafia drug traffickers, Latin American death squads, smugglers of children’s organs and of children – glide side-by-side with “respectable” titans of commerce, honored statesmen (and women) and sometimes revered leaders of religion and guardians of morality. Both the adhesive and the lubricant of the intricate waltz of mutual interest is money and power, of course. Goldstone’s chapters on Lombardi’s adventures in the artsy colony of “snowbirds” (as native Texans not-so-fondly call them), brought south at huge expense to prove Texans care about something besides money, are interesting. As a white native of Mississippi (living not far from a WalMart recently bombed for refusing to carry Confederate flags), I am only too aware of the seething undercurrent of sectional envy/jealousy and racist paranoia – even if the Rebel Flag is currently waved by a New Yorker – ready to bust loose. I can’t shake the thought (which I hope is an absurd one) that certain of the oil-drunk cowboys (including honorary rednecks from up north) in a very real tussle over money, power and national leadership shared some possible ambition of the Houston Bin Ladens and other oil emirs to reduce the power of “Jewish” New York. In the event, 9-11 was, or became, an ideal crisis for several factions. Drawn years before September 11th, 2001, Lombardi’s artworks point out frightening possibilities. Despite Netanyahu’s solemn prediction of 2002 that W. Bush’s attack on Iraq would lead to a wave of democracy and freedom across the Middle East, Israel’s premier seems relatively content with the chaos that resulted instead. Israel’s preference for Islamist radicals over secular Arab nationalists was most recently reiterated by former Israeli ambassador Oren, and Israel’s longtime tacit collaboration with Saudi Arabia (and continuing arms sales to Iran) are better understood after a look at Lombardi’s now-ancient drawings. I was specifically asked to try to link in the currently breaking (April 2016) “Panama Papers” scandal as it pertains to Lombardi’s work. Certainly shell companies and banks figure prominently in his works, but the most interesting, perhaps disturbing P.P. connection concerns some of the groups exposing Mossack Fonseca rather than the Panama law firm exposed. Author Goldstone was way ahead in noting the curious ties of a Berlin-based “Transparency International” NGO, ostensibly concerned with fighting corruption, which invited Lombardi to present at the 1999 Durban Anti-Corruption Conference. The conference would have fulfilled Lombardi’s fondest dreams, especially with his hero Nelson Mandela in attendance. The invitation was found among Lombardi’s papers, yet the often boastful artist never mentioned this triumph to anyone and there is no indication that he attended the South African conference. Eight months after receiving the invitation he was dead. In the end, Goldstone’s valuable book, like Lombardi’s graphics, can only offer clues. Lombardi’s leftist sensibilities may have triumphed over his art business instinct to compromise with an “anti-corruption” group funded by Bechtel, Merck, BP, the soon-to-be disgraced Arthur Andersen and the soon-to-be unspeakable Enron. Reveling in the artist’s life of extremes, rubbing shoulders with Big Money one minute and spitting in its face the next, perhaps Lombardi did his homework on George Soros and the “transparency” movement and saw one well-baited trap too many. The Soros Foundation is a key link between the “anti-corruption” TI and the guardians of the Panama Papers leaks, the International Consortium of Investigative Journalists, which pilloried America’s foes for several weeks before getting into some of the 441 U.S. accounts. 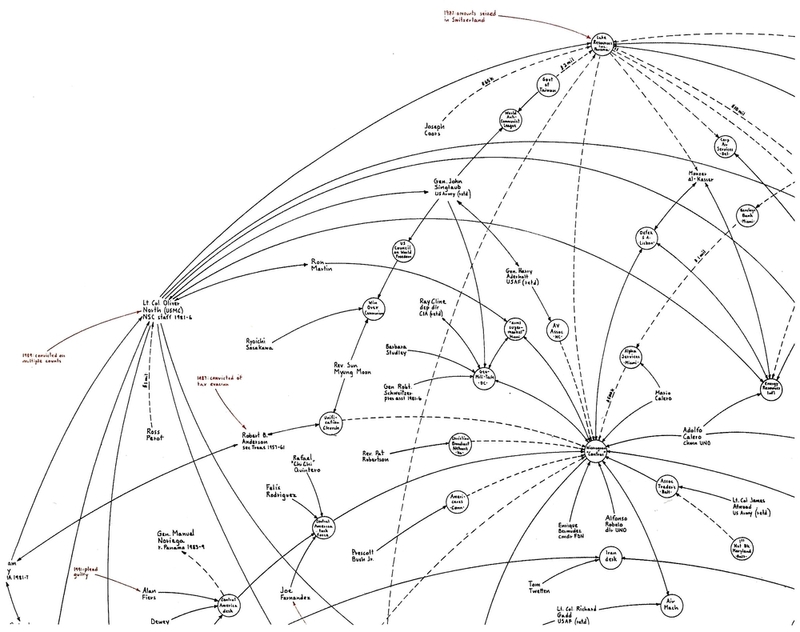 A contemporary Lombardi graph would draw an elegant spiderweb effortlessly connecting ICIJ and TI to a third dubious node, the Organized Crime and Corruption Project (OCCRP), whose website boasts of their funding by Soros Foundations Network, the U.S. Agency for International Development (which fronted for CIA death squads in Vietnam and Latin America) and OCCRP’s collaboration with Radio Free Europe – a long-discredited CIA operation – apparently still rockin’ in the Czech Republic. Much as the supple term “terrorism” is never applied to the U.S. or its allies, “corruption” and “tyranny” seem to only get noticed when done by entities that have outlived their usefulness or refuse to toe the U.S. line. [Among purported Panama perps, America’s pal Poroshenko of Ukraine hardly gets noticed, while Putin’s far less direct guilt-by-association gets top billing.] Like “humanitarian intervention,” anti-corruption is hard to argue against and always does “some good” – it is as likely to be the major propaganda pretext for U.S. wars and corporate meddling under the next Clinton as it was the last. In August, 1999, Lombardi was visited by Transparency International’s chair, Peter Eigen, who once said “the World Trade Organization is the natural universal guardian against corruption.” Some may recall the “Battle in Seattle” that year, where Secretary of State (and Hillary mentor) Madeleine Albright demanded the city police “crush” the tens of thousands of anti-globalization protesters who nonetheless succeeded in shutting the WTO meeting down. Shortly after Eigen’s visit, Lombardi’s invitation to Durban arrived. Perhaps elation that his big triumph was clearly in sight turned to weary despair at how easily the Powers that Be turn reform into repression and revolution into a laundry-soap ad. Like a Rivera mural in a Rockefeller bank lobby, Lombardi was to be added to Global Capitalism’s mantelpiece of safely co-opted (remember that word from the Sixties?) rebels. Perhaps he was killed because he couldn’t be bought, or maybe he killed himself for the same reason. Either way, they killed him.